The Affinity Storm is the All-Mountain ski for ladies who prefer a ski that carves hard. At 84mm underfoot the Storm is far from the widest all-mountain ski out there so it does lose out a bit in the float category but has huge edge hold and carving ability on firmer snow pack. With Adaptive Rocker, the Affinity Storm has a bit of rise to the tip, making for effortless turn initiation and catch free feel when the snow pack breaks down or when you venture off- piste. Rounding out the turn, a full woodcore and step down sidewall construction give the Affinity Storm a very lively feel with great pop towards the finish of the turn and unfailing edge hold through the middle. Polished off with the Lightrak binding system to offer extra leverage and power to the edge the Affinity Storm is the whole package for aggressive skiers. If carving at speed is your favorite but the soft snow and open bowls call your name from time to time the Affinity Storm will keep up where ever you point 'em. 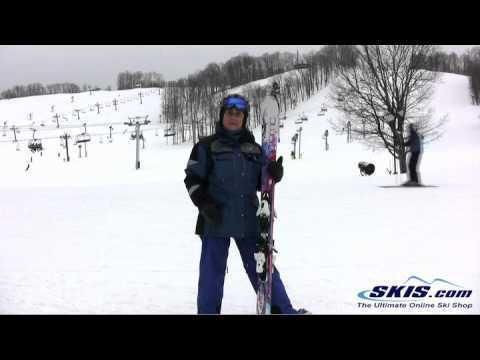 Atomic Affianty Storm Womens Skis 2012.